2Frogs Exhibition and Sales Schedule for 2011. Spring is trying its best to wake up the flowers with its rain. As eager as I am to see spring succeed, anxiety takes over to start my own spring cleaning. While my home is still smothered under its winter’s weight, my studio is overflowing with pots and mugs and muses. They need to fill shelves and cabinets of others to be admired and loved. 2Frogs Ceramic Arts will be participating in the following events for 2011. 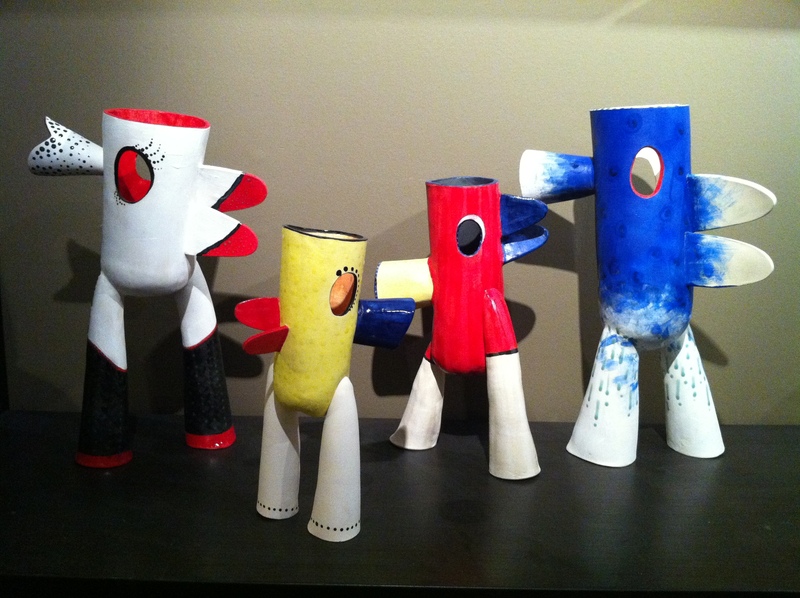 ClaySpace Featured Artist Exhibition: A Family Affair – featuring 2Frogs Ceramic Arts and art works by Lance, Nathan and Matthew Rutter. Opening night to be announced. There are a couple more still in planning and these will be updated as they firm up. Future event updates will be added to a separate page for events on this site. Sometimes, inspiration finds you. And makes you pay $1. Story of how a 5 year old inspired the Kissipupu Tribe Vessels. Like most parents you have or have had a drawing from your child on your refrigerator, office wall or bulletin board. I’ve even had a collection of paper bead necklaces hanging from my rear view mirror of my car to show my boys that I want to see their gift every day while I drive to work. The smiles on their faces are worth the obstruction of view while driving. You start collecting and collecting, and eventually some “mysteriously” disappear. And as you sort for the next disappearance, your eye catches on a piece of work and you stop and think, smile and even wonder at the brilliance in their color choices or brush strokes. Right. Maybe this child might be the next Miro, or Dali, or Picasso! So we continue to collect paintings, trinkets, clay globs and pasta stuck on paper with glue and glitter…and more glitter. Display them prominently on your cabinet door, window ledge, etc. When our son Matthew was 5 yrs old, he was asked what he wanted to be when he grows up. He answered, “I want to be an artist who sold a lot of stuff.” So then one day, when he drew a sketch, signed his name and wrote a $1 price tag, he expected his parents to pay. Art in our house does not come free. So I bought a sketch. 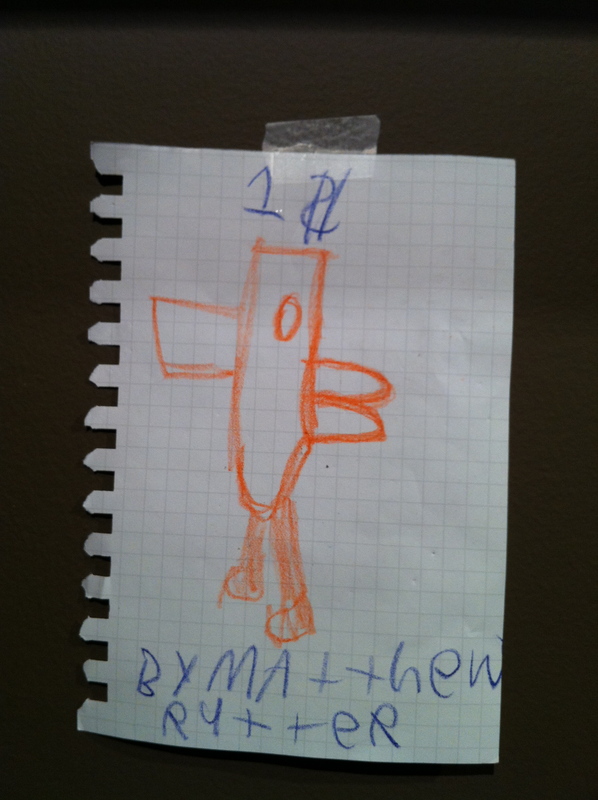 I paid him $1 and posted it on my studio wall. And one afternoon, this sketch became a sculptue and he named it Kissipupu. And so the Kissipupu Tribe was formed. One Kissipupu, then another, then another. Each developing a personality of it’s own. I don’t know exactly how their personalities developed… the clay has a mind of their own and ask to be brought to life. I just listen. How does inspiration find you? Have an open mind and the possibilities present themselves in the most unexpected ways. Will you also create a sculpture? Write a story? Sew a quilt? Leave a comment to this post and share your inspiration story with me. Author 2FrogsPosted on January 22, 2011 January 22, 2011 Categories Ceramic PotteryTags Inspiration, Kissipupu, Sculpture1 Comment on Sometimes, inspiration finds you. And makes you pay $1. Wow! Good bye 2010 and HELLO 2011! New year and a new resolution. Will this count since I didn’t really follow through with last year’s resolution? Does that count since I don’t remember last year’s resolution? At least I’m off to a good start. 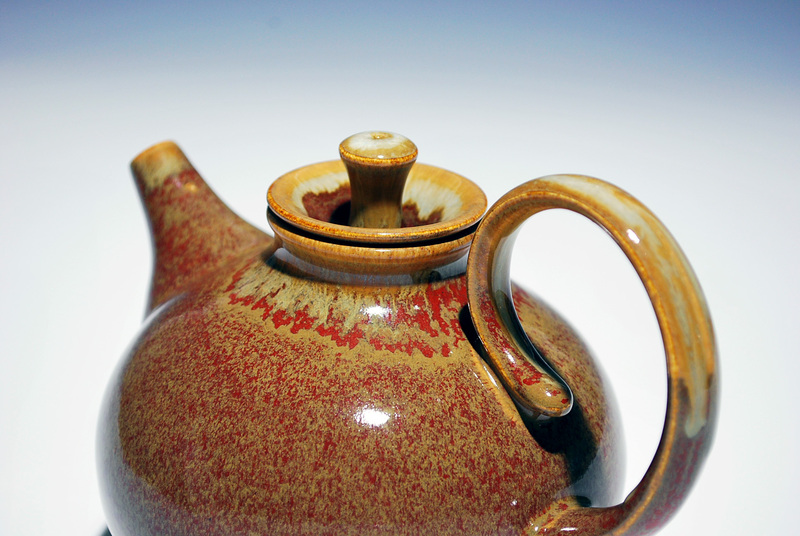 I am posting 3 new teapots with new glaze effects, couple of new nodding vases too. These have been added to 2Frogs Studio @Etsy with multiple views. So check them out. 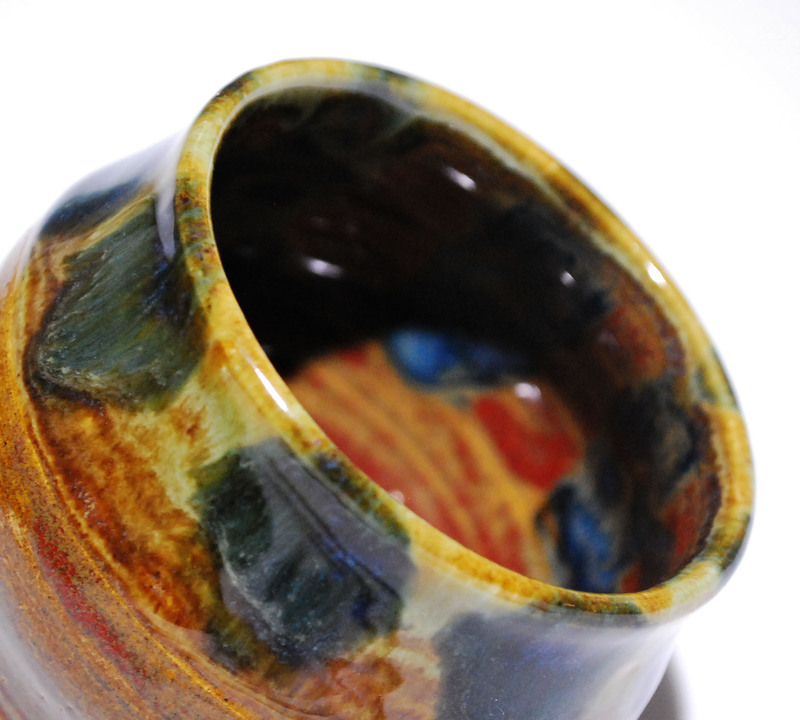 There is a certain expectation of what I might see when I open a glaze firing. This time, the wait was just too much. I had 4 teapots loaded with new glaze combination that I haven’t tried before. I was anxious and eager at the same time. Out of the 4 that went in, one didn’t survive. It was a beautiful form, but 75% success rate can still be celebrated. 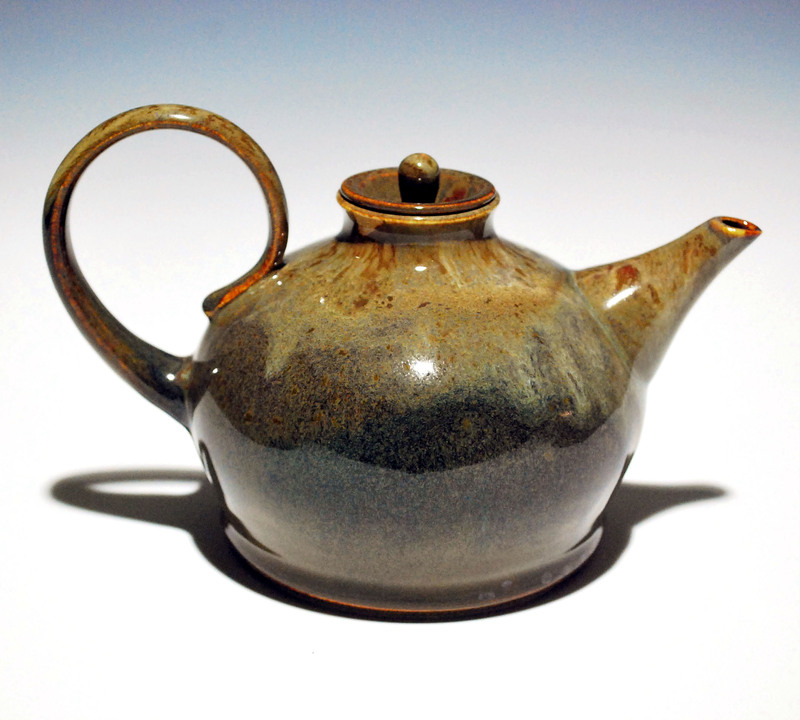 This Brown Potbelly Teapot has to be my favorite so far. 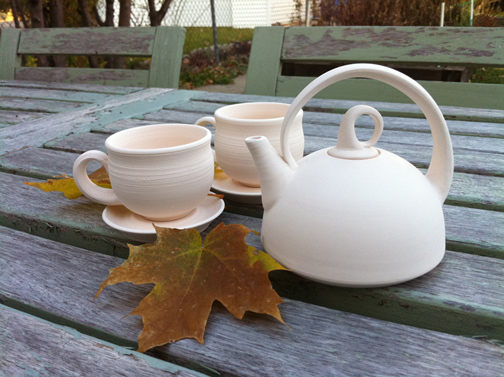 This glaze color was a complete surprise when I pulled the teapot out of the kiln. First of all, it was way too hot to handle but that’s just a testiment to how excited I was to see it. Oil Spot over Red Glaze with White Grotelle. 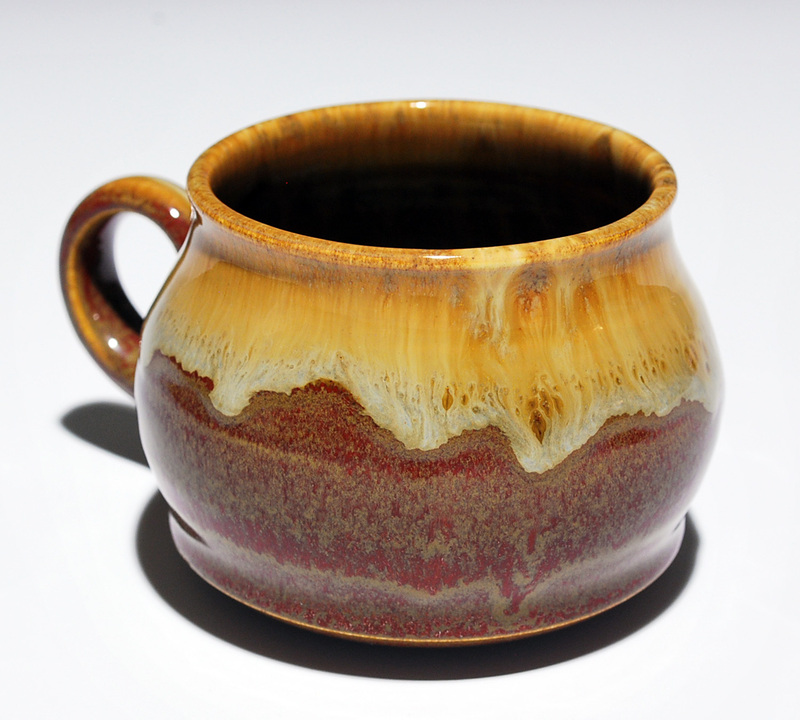 The combination of Red Glaze and the Oil Spot created this deep brown with beautiful texture to create depth. 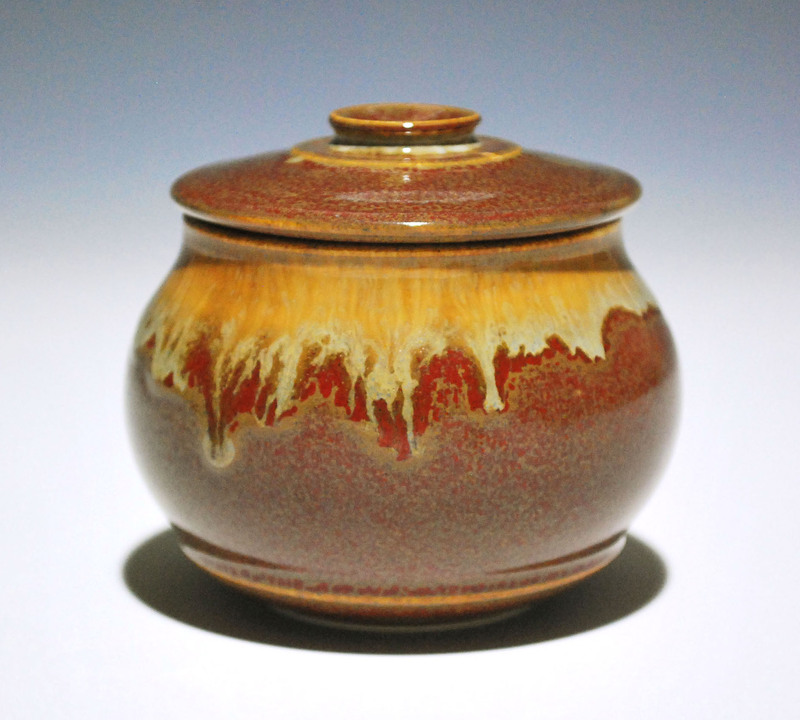 The white over lid area and handle created the glazes to run creating the movement and intrigue. I tried an extra long single pulled handle and the contrast between the bulbous body with a slender handle is refreshing. Now, I’ll have to try to duplicate this again and again. When at first you don’t succeed, try, try again. This worked for the Blue Fire Teapot. First pass glazing was not very interesting and consider calling it a failure. So reglazing was more of an experiment than anything. Still, the outcome was a bit of a surprize too. It began its life as a dark blue on the bottom half of its body with a light blue top . In the second firing I experimented with layering a green glaze over blue to see what would happen. The result was a fiery dance of the colors. Here’s a dilemma, what to name my teapots. While Potbelly is more of a descriptive name for the form, might not be as fun to call them. At least, that’s what my husband pointed out. So readers, help me out. 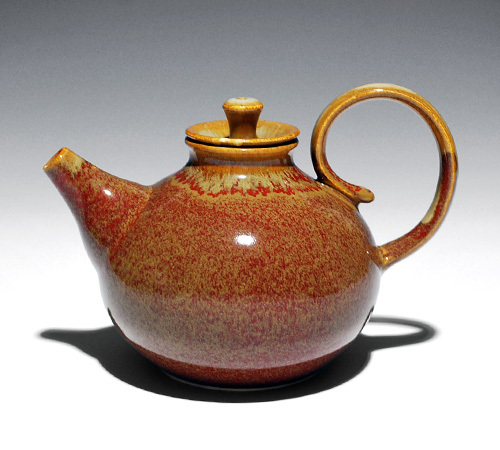 This teapot and the first teapot have the same colors but one has a handle that is long and loops towards the spout, and this one is curled over towards the lid. Wider at the base and slightly bigger than the first one, this teapot has a much smaller lid opening requiring a ball tea strainer. You might ask “how do you wash the teapot with such small opening?”. Well, you don’t wash a clay teapot with detergents because teh teapot will be “coated” and the aromatic peaks of the particular tea will be emphasized, giving it a more satisfying taste. Therefore, you should try to use one tea families for the tea pot to keep the flavors more pure. Ha! Tea enjoyment 101. Oh, to finish the though… just rinse with hot water when you are finished. That’s it. 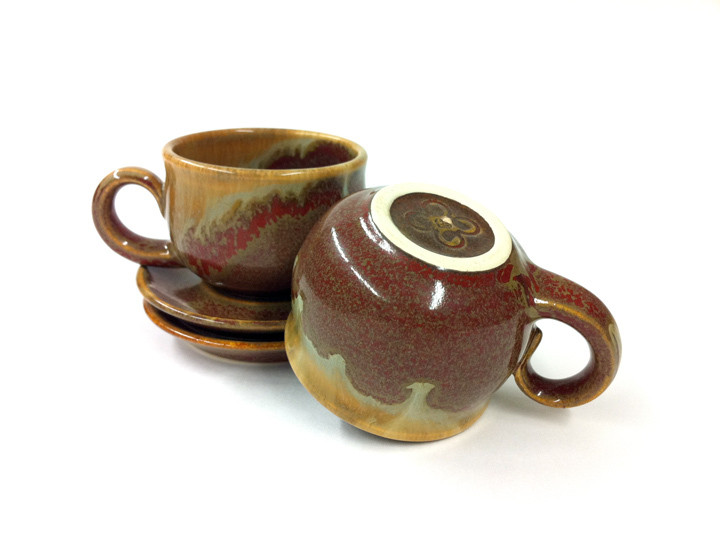 I’ve finished a couple of tea cups or Yunomi’s too. These will soon be uploaded to Etsy too. Thanks for visiting. I’d love to hear your thoughts so leave me a note and subscribe to get all of my (occasional) posts. This year’s resolution? To feed my teapot passion. To balance work, family and passion. To update my blog more regularly. To travel. Ask me next year. Author 2FrogsPosted on January 6, 2011 January 6, 2011 Categories Ceramic PotteryTags 2 Frogs, 2Frogs, Ceramics, Cone 6, Electric Kiln Fired, Miki Shim, Oil Spot, Pottery, Red Glaze, Tea, Teapots, White Stoneware, YunomiLeave a comment on Happy New Year! Sometimes, pots are beautiful even without the glaze,… in fact, sometimes, i’m in love even before it gets to the first firing. The trick is to not to blow it up in the bisque firing or mess it up with the wrong glaze. I thought I would try out my iPhone’s picture quality… it’s not bad. These pots survived the bisque firing. 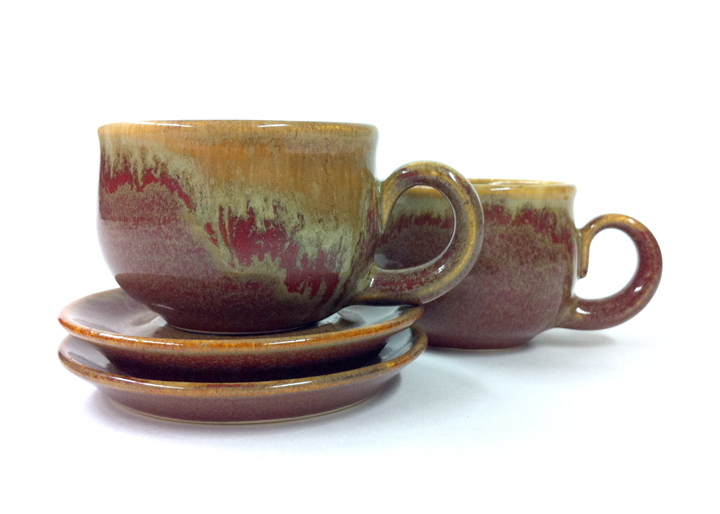 Thank goodness because the espresso cups are a special order, already paid for. 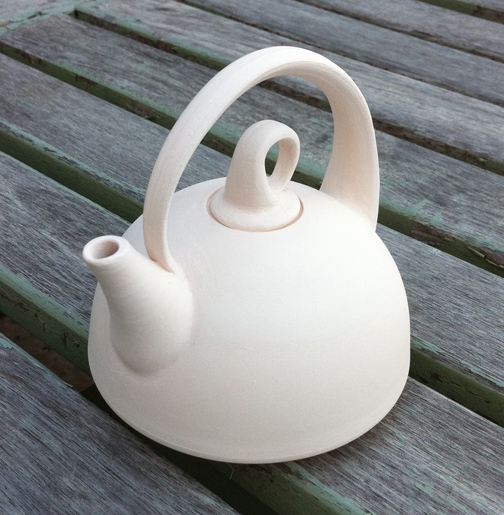 And the other one is a darling little soy sauce pot… a tiny teapot? Pretend tea party teapot? It’s only about 5 in tall. I was hoping that the leaves would give away its size but it’s not really doing its job. I will glaze tomorrow and fire on Wednesday and hopefully on Friday, I can post the finished piece. Success or failure, I will post my results. Subscribe for an automatic update! Glaze firing was a success! While the little tea pot did survive the glazing, it is unfortunately a sample pot. Reasons? The spout was mis-engineered. Who thought that being a potter means you need to have an understanding of chemistry and engineering! The spout does not function because it’s not attached at a reasonable angle for liquid to pour properly. 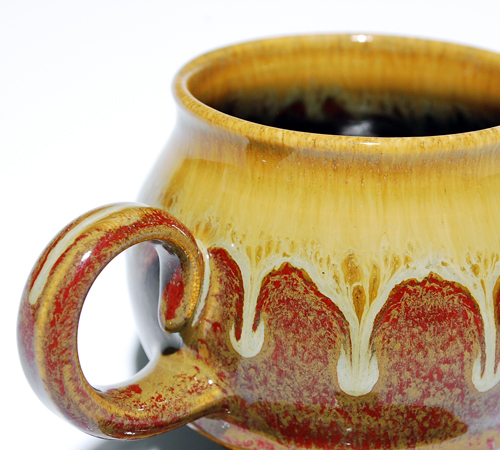 Additionally, the glaze from the inside of the spout tip did not adhere well, so the liquid drips from the spout. All in all, it looks good, but it would be classified as a non-functional item. I will post photo of that soon. 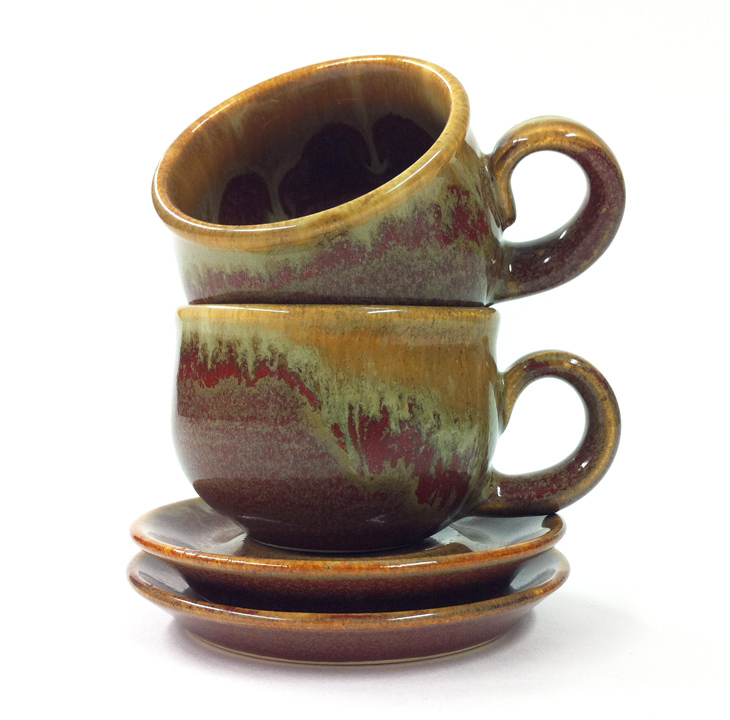 I do have photos of the esspresso cups with the saucers that were special ordered for Jenny from my 2Frogs Studio Shop on Etsy. Wow, it’s been a busy summer! And too soon over. With temperatures below 45 last night, it hits you right away that in Chicago, fall comes and goes even faster. 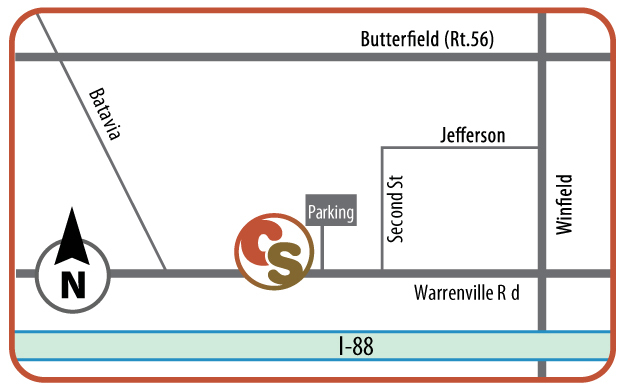 So far I am getting a nice flow of traffic and some sales… ok 2. Still very excited to show and sell. This series of pots are with the red glaze. 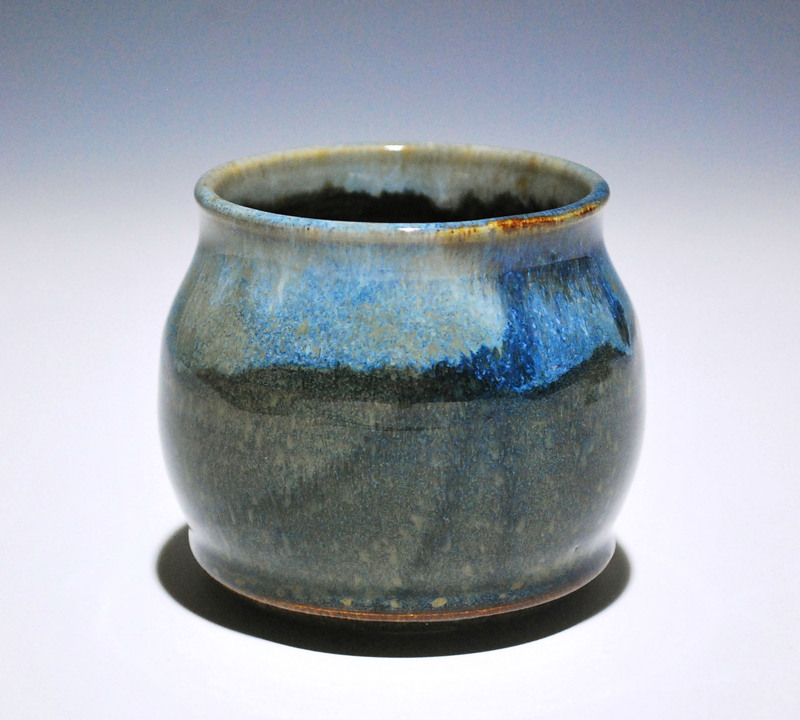 It’s working really nicely and mixed with a cream glaze or with the blue glaze, it give me results that are somewhat predictable and spontaneous at the same time. 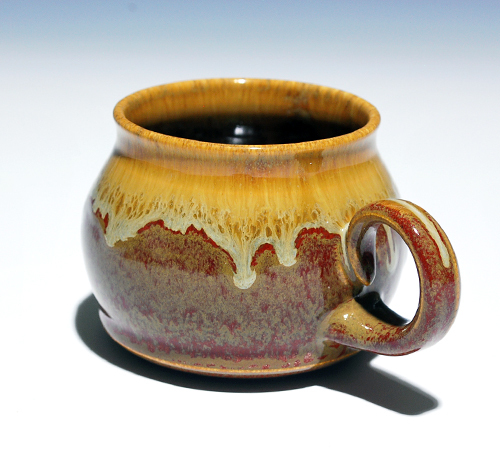 I’m also launching my “potbelly” series of pots starting with mugs and lidded jars. It’s called Potbelly because it has a nice paunch belly. My mom is the one to thank for this idea, and I’ll take the credit for improving on this. 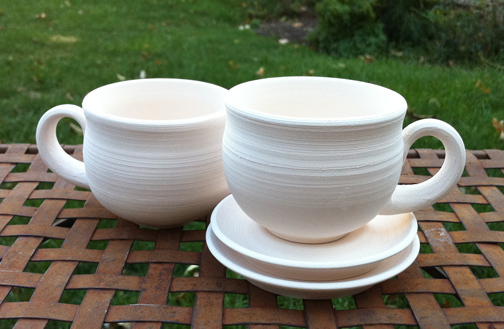 Unlike most handmade mugs, I use fine stoneware so that I can throw thinner but still be strong. The design is rounded in the middle and hold more than you think, while the bottom still shows stability and carries the weight and keeps coffe or tea warm. The rim is rounded and flares out a bit and comfortably forms to your lips. I like the handle the best. It’s is hand pulled and curves into itself and attached upside down. I think this Red Teapot looks good. I have more and they are posted on Etsy, and a couple more waiting to be glazed. I think I will keep exploring but these shapes are both delicate and confident at the same time. I am working on a few more forms and hope to post new soon.